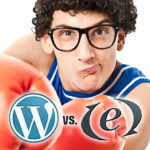 Home » Design » Web Design: Word Press vs Expression Engine – Who Wins? 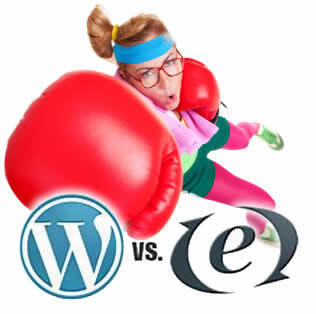 There are many varying opinions on which CMS is better, Word Press (WP) or Expression Engine (EE). The real question is: Who is it better for? To shed needed light on this issue for all the parties involved in web design and development, I’ve produced a series of articles that identifies the positives and negatives of each CMS. Pros amp; Cons of EE vs WP. Which one is better for WEB DESIGN FIRMS? Expression Engine wins this one hands down, with a serious caveat- designers with little to no coding experience win here. As a web designer, you may not have extensive knowledge on how to write PHP. In order to customize and work with WordPress you are going to need to know how to code. Coding is something better suited for a web developer. EE has a support base that is fair but not as big as WP. Finding expert help can be a little more cumbersome in EE, but assuming you know what you are doing, it is very powerful out of the box. In order to gain the most from WordPress you may have to find, install, and sometimes tweak 3rd party plugins. This can take more time and eat away at your profits. As a web designer, one of the best things about EE is the ability to charge more to a client because it has an upfront cost just to set it up. You can get a client to pay for a perceived premium product. WP is free and EE has a $200 – $300 initial license plus widget costs. The suggested value is in EE’s court. Also, it provides a bit more job security for the web designer. There are not as many designers out there that do Expression Engine. This means that a client that takes on a designer using EE is going to be stuck with that designer because there are less designers with EE experience if the client wanted to change designers or go in a different direction. 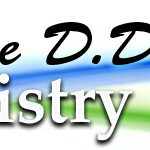 Your competition may or may not be using EE and your clients will have a more difficult time jumping ship. Simple to admin – emneed to update content frequently? For DreamSpectrum, we use both Expression Engine and Word Press. We offer both CMS platforms because we employ people gifted in all aspects of web design, graphic design, blogging and web development. Having such a skilled and agile staff allows us to offer what clients want and need without relying exclusively on one CMS platform. Since we employ excellent developers, none of the usual Word Press expressed limitations apply. But if a client is absolutely determined to use Express Engine, we are willing to charge more (due to the higher costs of setting up and maintaining EE vs WP). We would prefer to keep costs down for our clients, which is why we use WP quite often. We are as comfortable in Word Press as we are in our own skin. Most uninitiated designers feel as if there are design limitations in Word Press. Some even communicate this false message to their potential clients. I can assure you, there has never been a design given to me from a designer that I could not recreate in WP. Companies with less experience may argue that. However, with the right knowledge, all is possible in Word Press. It should be evident as to what a web designer’s skill level is based on their exclusive promotion of a limited and costly platform like EE instead of a diverse and flexible CMS platform like WP. Although WP design and implementation may take some longer to create and launch than others, it depends on your level of expertise as a web designer to truly give your client what they want and pay for.